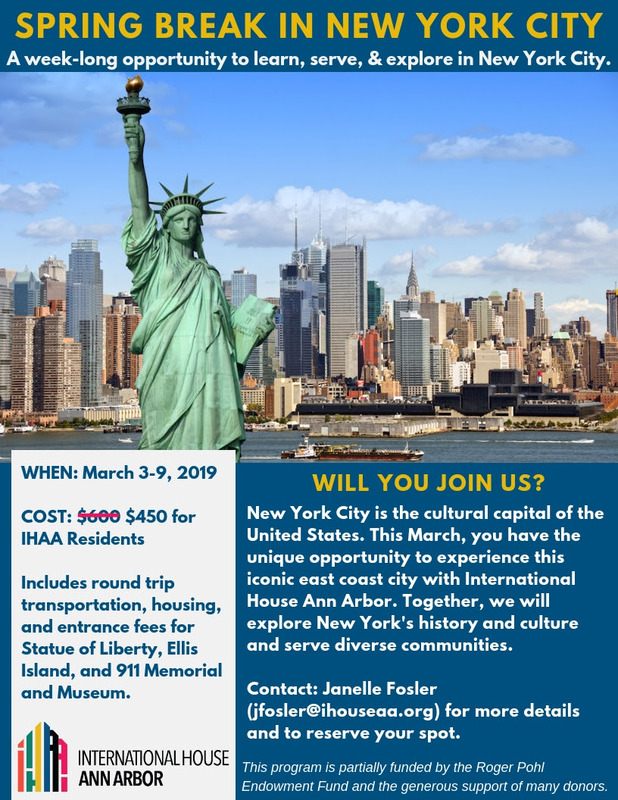 Join International House Ann Arbor to explore New York City from March 3-9, 2019 on the IHAA Annual Spring Break Trip! We will be visiting the Statue of Liberty, Ellis Island, and the 9-11 Memorial, and expanding the itinerary together based on participant interests. There will also be time for you to explore on your own or in small groups. The cost of this trip will be reduced to $450 for IHAA residents and we hope to do some fundraising together to further reduce this cost. If you have friends that are interested in coming, the price for non-residents will be $600. Space is limited and this opportunity fills up quickly. If you are interested, please email me or complete this form.